Melatonin is a supplement that works in harmony with your natural sleep cycle to support a sound, tranquil sleep. Melatonin is an excellent choice for people experiencing occasional sleeplessness, those experiencing jet lag, or anyone looking to improve their overall sleep quality. Melatonin 5mg. Other Ingredients: Dicalcium Phosphate, Cellulose (Plant Origin), Croscarmellose. Contains <2% of: Cellulose Coating, Natural Palm Leaf Glaze, Silica, Vegetable Magnesium Stearate. 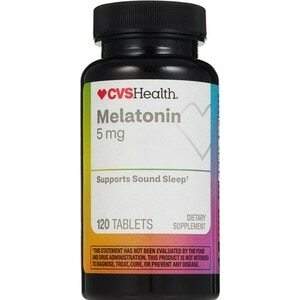 For adults, take one (1) tablet at bedtime as Melatonin may produce drowsiness. As a reminder, discuss the supplements and medications you take with your health care providers. Not intended for use by pregnant or nursing women. If you are taking any medications or have any medical condition, consult your doctor before use. Discontinue use and consult your doctor if any adverse reactions occur. Do not drive, operate machinery or consume alcohol when taking this product. Limit use to two months with a break of one week. Not intended for use by children. No yeast, wheat, gluten, milk or milk derivatives, lactose, sugar, preservatives, soy, artificial color, artificial flavor, salt. Keep out of reach of children. Store at room temperature and avoid excessive heat. Tamper resistant: Do not use if seal under cap is broken or missing.